I should probably be writing about Drew Smyly, who’s suddenly sidelined with what he called a “soggy” arm, and may not be ready for opening day. But I’m going to write about Felix, and I will attempt to make it topical by saying that Felix is suddenly even more important to the M’s 2017. With the bottom of the M’s rotation in a bit of flux, and as we all wait to hear why Drew Smyly’s arm is suddenly taking on water, the M’s need a bounce-back season from Felix more than ever. The M’s were never supposed to be a dominant run-prevention group, but the return of Good Felix makes the M’s path to contention a whole lot easier. The M’s attempts to restore Felix’s regality took two paths, as detailed in this great Ryan Divish piece from late last year. First, Felix had mechanical problems which impacted his command, and second, he targeted the bottom of the zone almost exclusively, allowing hitters to either take low fastballs and draw walks (his 2016 walk rate was the highest of his career) or wait for him to throw a get-it-over strike higher up. The theory, as described by Jerry Dipoto in that Divish article, is that hitters got comfortable against him knowing where he was going to spot his fastball. An objection I’ve heard on Twitter and one I talked about back in June is that it’s dangerous to so completely change a pitcher’s plan of attack; Felix is Felix because of his great sinking fastball/change – if you try to force him to elevate four-seamers, something he hasn’t done much of since he threw 97, he could really struggle. Well, in this case, I’m fully on board with the M’s change of strategy. 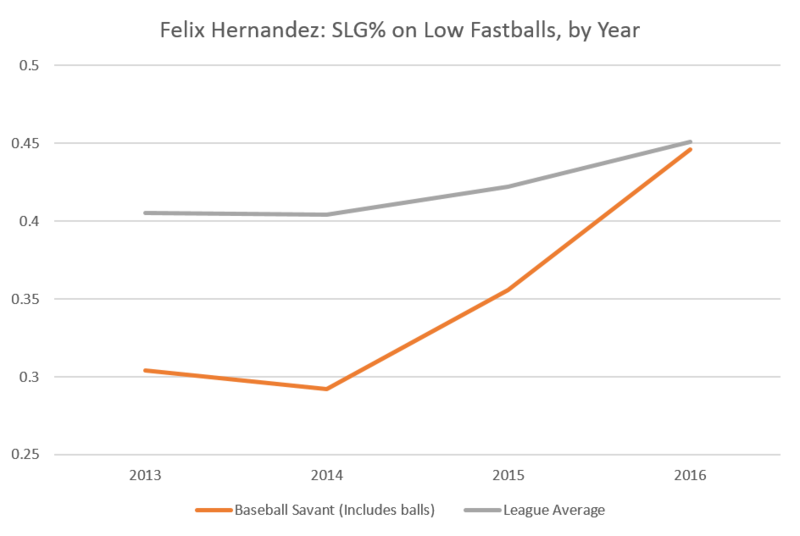 Felix’s 2013-14 peak (by fWAR) and his 2015-16 struggles have coincided with some fairly large-scale changes in how the league attacks low fastballs, and batters have made adjustments that make them much better against low fastballs than they were even a couple of years ago. 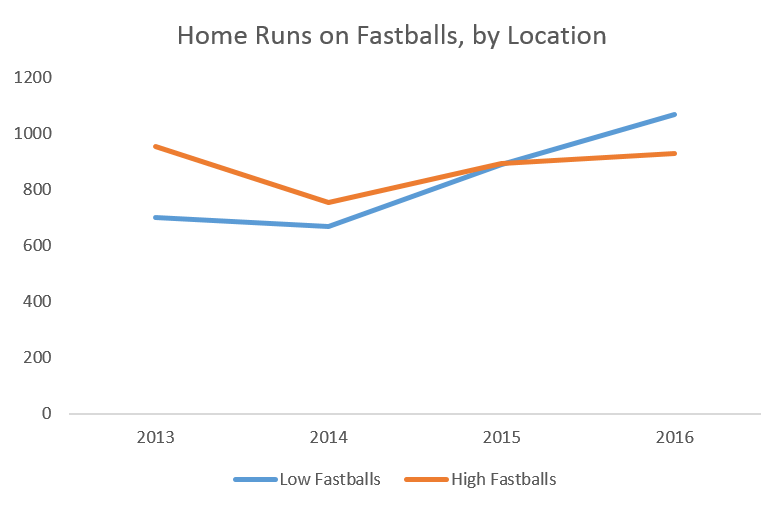 Jeff Sullivan pointed this out at FG a while back, but the spike in home runs last year did not come from batters driving more high fastballs. Instead, it was largely the result of a sea change in how they attacked *low* fastballs. Jeff compared 2008-2015 with 2016, while I’m going to focus on the past four years. 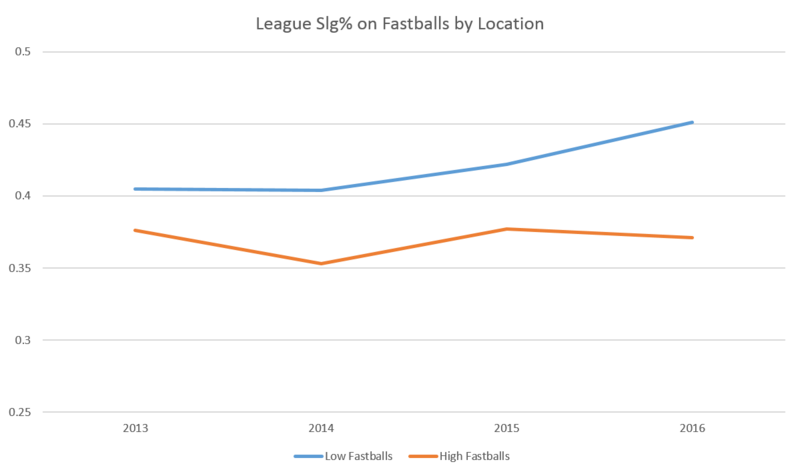 Here’s a graph showing the league’s slugging percentage on fastballs in the lower third of the zone (and below/to the side of the zone) and on fastballs up (and out of) the zone. Batters fared better on low FBs – barely – in 2013, but the gap has grown thanks to a jump in results on low FBs in 2015 and 2016. HRs on low FBs overtook HRs on high FBs in 2015, and while HRs were up everywhere in 2016, low FBs were much more likely to go for HRs in 2016. Batters have adjusted not just to low pitches, but to low FBs. It’s not about putting more of them in play (balls in play rates continue to drop), they are doing far more damage on these pitches than batters did (many of the SAME batters, remember) in 2014. Now we’re seeing the counter-adjustments. The strike zone’s expansion slowed and then, ever so slightly, reversed. 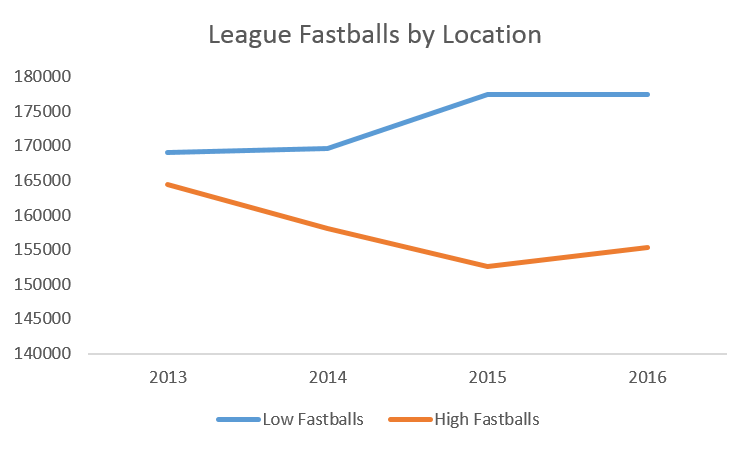 Hitters like Josh Donaldson and others learned to elevate low fastballs, and now hit low fastballs for power. The league as a whole first changed in a direction that seemed tailor-made for Felix to take advantage of, and he responded with two of his best seasons. The league as a whole has now changed in ways that seem perfectly designed to hurt Felix, and they’ve done so. Whereas Felix used to make his living on low fastballs, his advantage is essentially gone now. Felix is now league average when he throws a low FB, which is terrible, because almost by definition, any elevated fastball from Felix is a mistake. These data come from BaseballSavant.com, but the change is even starker if you focus on the bottom third of the zone in Brooks Baseball’s charts. Excluding the out-of-zone contact and focusing just on low strikes, they show Felix’s SLG%-against on fastballs as going from .448 in 2013+2014 to .661 in 2015+2016. Felix needs to change. Here’s a chart of his vertical pitch locations throughout his career. As Felix has lost velocity, he’s increasingly targeted the bottom of the zone (below the midpoint of the zone). 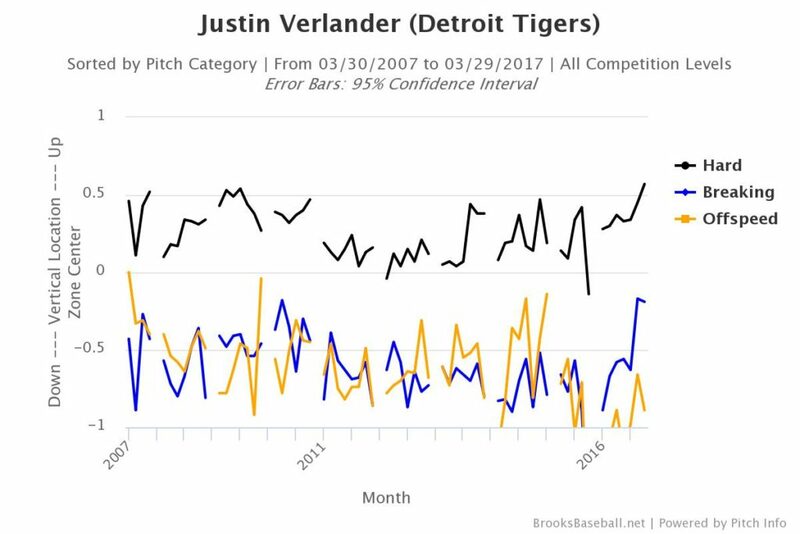 He could learn something by looking at what Justin Verlander’s done, as shown below. Verlander was struggling for a few years, and his return to form has coincided with what looks like an intentional move UP in the zone. This may be uncomfortable, but the benefits are significant. A counter-adjustment is warranted, and ANY change from Felix seems like it’d make it harder for batters, especially those intra-divisional hitters who have seen him often. Felix’s command may not be what it once was, but that’s why targeting something other than the low strike might help: predictability plus so-so command is worse than unpredictable and so-so command. So how’s it going? What meager data we have from the WBC and Spring training show that he’s already making some adjustments. His average FB height seems to be up this spring, especially in the WBC, where he used high FBs repeatedly to get weak contact, whiffs, and to set up his change/breaking balls. Unfortunately, he’s done this before – he’s thrown significantly higher FBs in the spring several times before, only to pitch differently once the regular season started. Felix doesn’t get enough credit for his pitching smarts, and it’s time for him to put them to use. 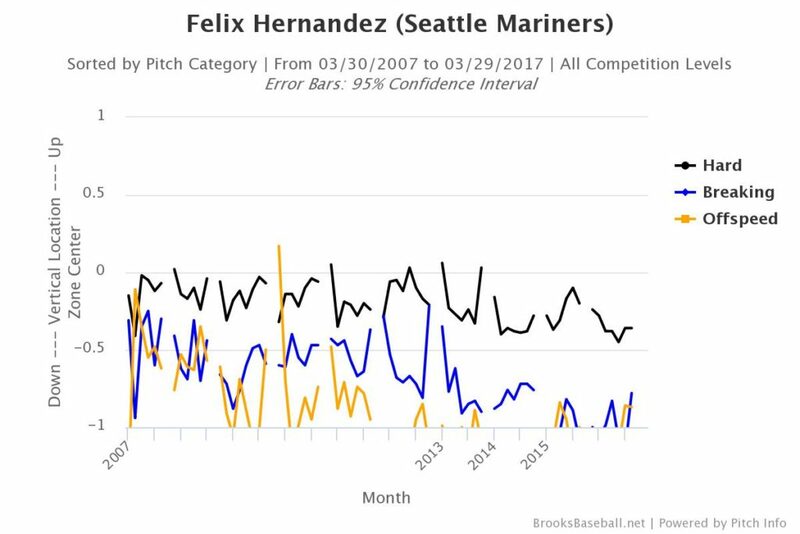 More than FB velocity, more than command, Felix needs to rediscover the high FB. This isn’t a quick fix, as we saw with Brandon Drury’s HR on a high FB yesterday. They’re risk in changing a successful approach, and there may be bumps in the road as Felix learns how/when to go high. Still, he can’t rely on last year’s game plan, and using the entire zone offers his best chance of retaking his throne. :Note: This post is similar to a lot of what Jake Mailhot had to say at LL a week or so ago, and both of us pointed to Jeff’s article at FG. Sorry to harp on this subject, but I wanted to talk about Felix’s adjustments specifically, and I wanted to get back to this topic after raising it (not just about FBs) midway through last year in one of my “what’s going on with Safeco?” posts. Great post, very informative. Keep up the good work! Thank you, Marc, for another succinct brief. In a recent post game interview, Felix mentioned he was trying to pitch to contact, and limit long at bats. He will never hit 96 – 97 mph again, but he has plenty of pitches he can command, so hopefully he can induce weak contact by using a sequence to keep batters off-balance in the on-going adjustment batter box battle.